The Jury Special Grand Prize at this year’s Festival Automobile International has been attributed to Porsche for its record of 18 overall victories in Le Mans. To celebrate this award, six Le Mans winning drivers were gathered together. The awards ceremony of the 32th Festival International Automobile was a very special moment for Porsche. The brand won the "Jury Special Grand Prize" delivered by a jury composed of experts in design, art, culture, motorsport and media for its success story in Le Mans. Since the first ever overall victory in 1970, Porsche has won the twice-around-the-clock race 18 times! Felix Bräutigam, Porsche AG director region Europe, received the "Grand Prize" surrounded by six drivers who have succeeded in Le Mans with Porsche: Hans Herrmann (1970), Hans-Joachim Stuck (1986/1987), Gijs van Lennep (1971/1976), Yannick Dalmas (1994), Stéphane Ortelli (1998) and Romain Dumas (2016). Standing in front of the passionate audience of 600 leading peronnalities in the French automotive industry, Felix Bräutigam claimed: "Turbo technology, aerodynamic improvements, dual-clutch transmissions, and now hybrid systems… innovation has always been the key to our many successes in Le Mans. Thanks to our drivers, who a genuine heroes, we managed to achieve this outstanding record at the 24H of Le Mans." For the event, Porsche has also brought together two iconic racing cars: the 917 K N°23, which brought home the first win in 1970, and the 919 hybrid who has joined the Porsche’s Le Mans hall of fame in 2016. Open to the public from 1th february to 5th, the Festival Automobile International gives a unique opportunity to see two of the most famous racing cars in the world. The Porsche Cayman GT4 Clubsport will run ahead of the starter field at the ADAC Rallye Deutschland. 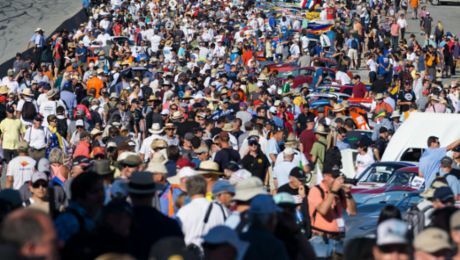 The Porsche Rennsport Reunion has lured over 57,000 spectators close to Monterey.